No longer losing her mind in a house filled with uninvited guests, Jennifer Lawrence is now a trained Russian assassin. She’s also a ballerina, and you wouldn’t be alone if you got some Black Swan vibes from the newest Red Sparrow trailer. Lawrence leads the spy thriller as Dominika Egorova, a woman who becomes the latest recruit in a Russian spy school led by an icy Charlotte Rampling. The newest trailer has a bunch of new footage since the first teaser back in the fall, teasing Lawrence’s transformation from scared Russian brunette to ice cold platinum blonde killer who wears extravagant bathing suits to the local pool. Her Dominika meets Joel Edgerton’s CIA agent, who tries to woo her over to his side of the spy game, and it's a classic trust-no-one-but-yourself. Based on the trailer, it looks like a pretty decent thriller; and worst case, Lawrence seducing and murdering bad dudes ought to be pretty entertaining. The film comes from Hunger Games director Francis Lawrence and also stars Jeremy Irons, Matthias Schoenaerts, and Mary-Louise Parker. 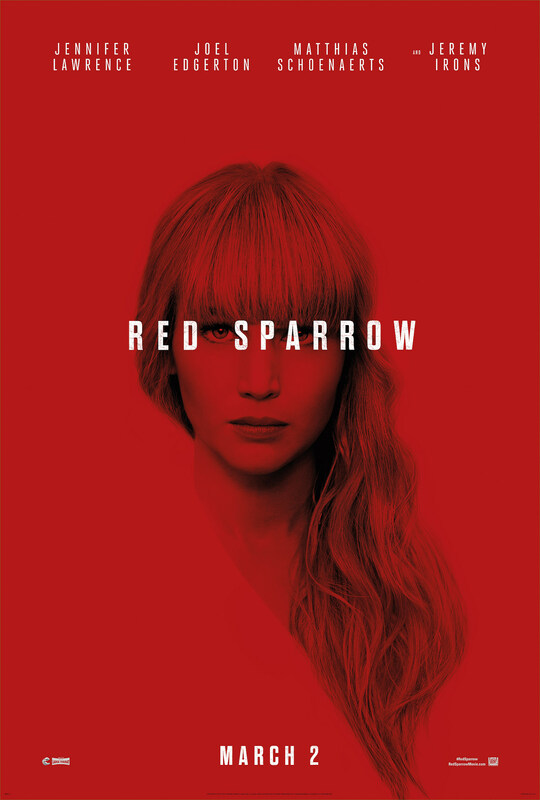 Red Sparrow hits theaters March 2. Check out the new super red poster below.